England were beaten in the first of their two autumn internationals, failing to register a point against France in Martigues. 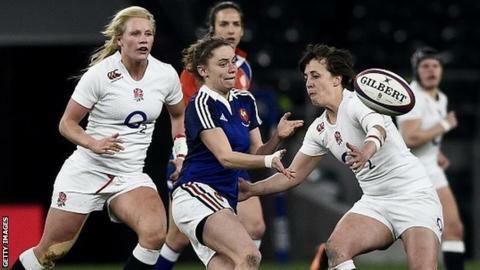 Both teams fielded inexperienced line-ups and England continued their run of failing to beat France for two years. Trailing to two first-half penalties from Audrey Abadie, they saw French wing Elodie Poublan cross for a try midway through the second period. England play Ireland at the Twickenham Stoop on 14 November. Simon Middleton's squad included six members of the World Cup-winning squad from Paris in August 2014, but was without players on the full-time England Sevens programme, who are targeting the Rio Olympics next year. Number eight Sarah Hunter captained the side as Katy McLean was one of those on Sevens duty. England: Sarah McKenna; Katie Mason, Lauren Cattell, Ceri Large, Charlotte Clapp; Emily Scott, Leanne Riley; Rochelle Clark, Amy Cokayne, Laura Keates; Tamara Taylor, Abbie Scott; Hannah Gallagher, Marlie Packer, Sarah Hunter (captain).